You are here: Home / Blog / General Information / How We Create the Finest Custom Jewelry, In-House! 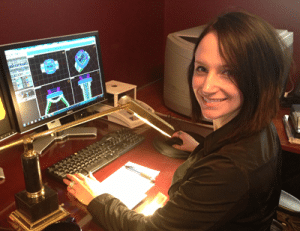 How We Create the Finest Custom Jewelry, In-House! What makes House of Diamonds stand out, not only locally, but across the Midwest? It is our ability to custom design and manufacture jewelry, in-house, with your input at each step in the process. We have made a significant investment in our technology and our staff has extensive experience in the industry. We guide you through every detail in our process. A question that we frequently get is how does this process work? The introduction: We are a family owned and operated business. To us, you aren’t just a number. 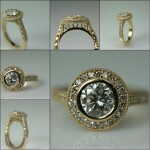 We will give you an education on diamonds and metals as well as the machines that will be used to create your design. We believe that the more you know, the happier you will be with your custom designed jewelry. Step One: Some of our clients come in with pictures of jewelry, artwork and more. Other people have no idea what they want and need our help creating the perfect design. Your first appointment will be with our designer, Karen Cullinane. In this meeting you are able to draw inspiration from a variety of styles and personalize them to your specifications. We design many different products, including pendants, bracelets, bridal sets, and other types of jewelry items for both ladies and gents. Step Two: Karen begins to translate her design work from sketches to CAD. CAD stands for Computer Aided Design. This advanced technology allows our clients to view their creation in a rotating digital format before a model is actually produced. What does the CAD system allow us to design? The possibilities are endless! Step Three: You will be able to see your design in 3D on a computer monitor. You can make any changes you wish to the digital format. We allow you to alter the design so that it is picture perfect. Step Four: Once you approve the digital rendering, we create a wax model with our 3D Printer, prototyping machine or 4-axis milling machine. At this time, you will be able to try it on and see your design as it comes together in size and scale. Step Five: Once you approve the wax model, our jewelers take over and begin the casting process. Our computerized centrifugal casting unit allows us to precisely cast your design into precious metals. This self-contained and safe method of casting metals permits House of Diamonds to be one of a very few elite, independent jewelers to cast platinum, palladium, 14kt and 18kt gold in our facility. Step Six: Next, our jewelers begin the cleanup, assembly and setting of your stones. Each stone is set by hand under high power magnification. Step Seven: Finally, the metal is buffed and polished for an amazing finish. The Finale: The pick up! We call you to let you know that your creation is ready. We also provide you a complimentary appraisal. Our success depends on the quality of our work and your happiness. At House of Diamonds, we stand behind all of our products.